On February 15, the Asian Studies Program hosted filmmaker Edward A. Burger and sound designer Douglas Quin for a screening and discussion of their film One Mind. Daphne Feller '17 reviews the event. What is the difference between a Buddhist documentary film and a documentary film that is simply about Buddhism? Edward A. Burger’s new film One Mind, screened at Skidmore on February 15, explores this difference poignantly. The title refers to the teachings of ninth century Chinese Zen master Huangbo, who emphasized the indivisibility between one’s perceptions and the phenomenal world, an appropriate allusion for the film and its message as a whole. 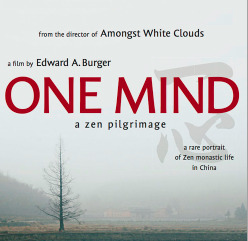 Burger’s One Mind embodies the filmmaker’s experience gained over many years spent with monks at Zhenru Chan monastery. The film itself has no clear plot or definitive anthropological questions to answer, but rather brings one into the monastery through the filmmaker’s lens and affords the viewer an experience of their own. Rather than seeking an objective representation of life at the monastery, One Mind draws attention to interactions between the inner landscapes of the mind and the outer landscapes experienced, in this case the lush hills of Jiangsi Province, China. The film progresses through the seasons, beginning with fall and concluding with summer, inviting viewers to experience for themselves the daily lives of this monastic community. Whether it be sitting upright in the meditation hall or meticulously picking tea leaves in the fields, their activities embody the experience of mindful action. These aforementioned aspects of One Mind are what have allowed Burger to create a distinctively Buddhist film. Before presenting the film in Davis Auditorium, Burger introduced his partner in sound editing, Douglas Quin, an important contributor to the film. Crisp, clear sound as well as carefully curated visual shots in One Mind are shape the film’s identity as "Buddhist" as they enhance the sensory experience of the viewer. This ethos is exemplified in a scene where monks harvests tea leaves. The scene begins with a full shot of the monk who joyously picks the leaves from the stem, cracking jokes with nearby monastics, and slowly closes in on his fingers. At this point the screen is completely occupied by the simple action of gently ripping the tea from the plant, accompanied by the soft sound produced by the act. This delicate scene brings us to the forefront of this experience in a way that almost requires full presence of sights and sounds as enhanced by the skills of Burger and Quin. Though the film makes no attempts to explain or elaborate on the tradition or philosophy of these Chan Buddhists, it expresses the journey inward that one must take when embarking on the Buddhist path. For Burger this journey means the transformation to a “wiser, kinder” human being. A similar endeavor was set out by the director of Into Great Silence, a film released in 2007, hoping to engender a man’s experience in a highly isolated Catholic monastic community in the French Alps. Both films may not be considered “informative” in a traditional sense of the word, since almost nothing is explicitly said about the religious communities themselves, but rather looks to encompass the experience in a candid and uninhibited way. In addition to the subtle answer Burger provides to this larger question of what makes a film distinctively Buddhist, One Mind also left me with lingering thoughts about other issues. For one, Burger spent more than 15 years with Chinese Buddhist communities. The film also seems to serve in a way to combat the static perceptions of geographically distant religions or communities that are sometimes prevalent in the so-called West. In addition, the film is rich with interactions between the monks’ and their natural environment, expressing again mindful action but also deep appreciation for the very ground that sustains them. This also touches upon the concern for environmental issues that we are all presently faced with and the connection that is strengthened when we investigate the relationship between the inner landscapes of the mind and the outer landscapes we occupy, as done in Buddhist meditative practices.